1.) Pick a new food that is different from any food fed in the past. This does not mean to just choose a different brand. In the past, veterinarians instructed pet owners to check the fine print on the ingredient list on each food label in order to pick a new food that is totally different in ingredients. Often the large label on the front of the bag mentions only two ingredients but in reality the food has many ingredients. A recent research study showed that, unfortunately, in normal commercial foods there is a lot of cross contamination of ingredients in the manufacturing process. For instance, a beef and wheat food may also contain chicken and rice because the pipeline was not cleaned out between their productions. As a result, there are ingredients in the food that are not on the label. Dermatologists and other specialists are now recommending foods whose main protein is rabbit. This is because rabbit is, genetically, the most remote from any other meat source. Duck is similar to chicken, lamb is similar to beef; they may have common antigens that will cause an allergy. Rabbit is the most unlike any other meat. You should not choose a food just because it is labeled "food for the sensitive skin or stomach," as this is not a valid claim. If there is an ingredient in that food to which the pet is allergic, there will still be symptoms. 2.) 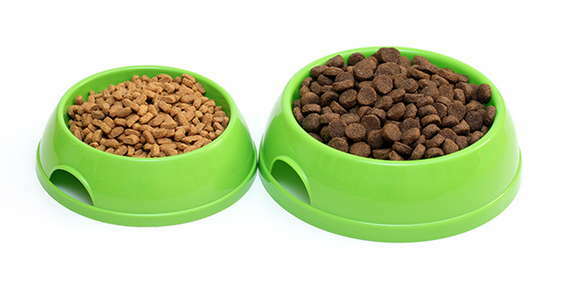 You should feed the new food for 12 weeks for dogs and 8 weeks in cats before you decide whether it works or not. 3.) You cannot feed other foods while your pet is on the food trial. This includes treats, table scraps, chewable vitamins, meat flavored toothpastes or chewable heartworm preventative.